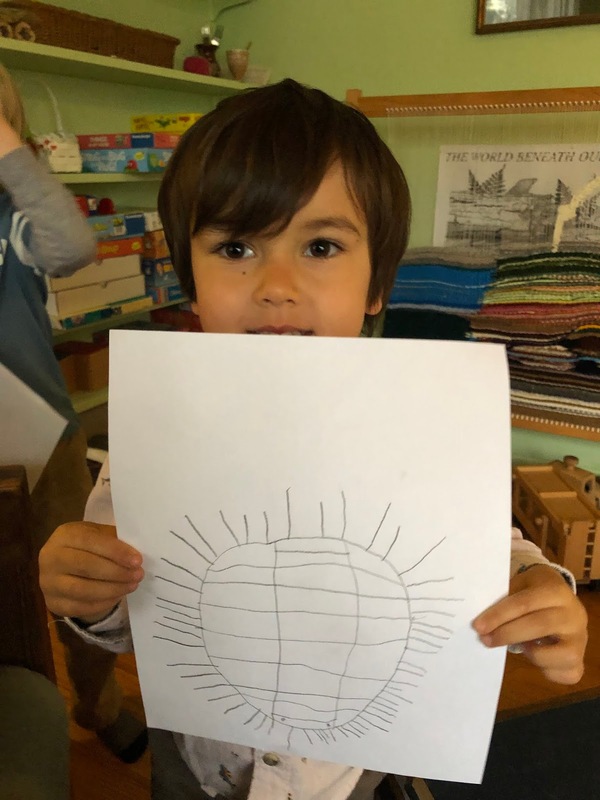 This was our second week working with this Circle inspired by the 1906 book The Story of the Root Children by Sibylle von Olfers. 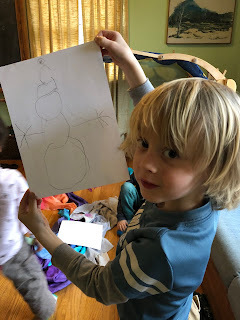 Here are my notes from The Root Children Circle, Week 1. Getting the Pikler back out for some fun indoor climbing... continued interest in scissors and construction paper in morning play time, lot of cutting elaborate designs along the folded edge of a piece of paper and then opening up the paper to see the exciting results... adding yoga to our morning Circle. 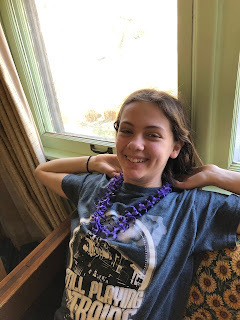 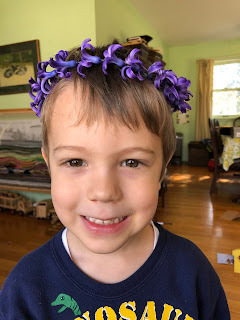 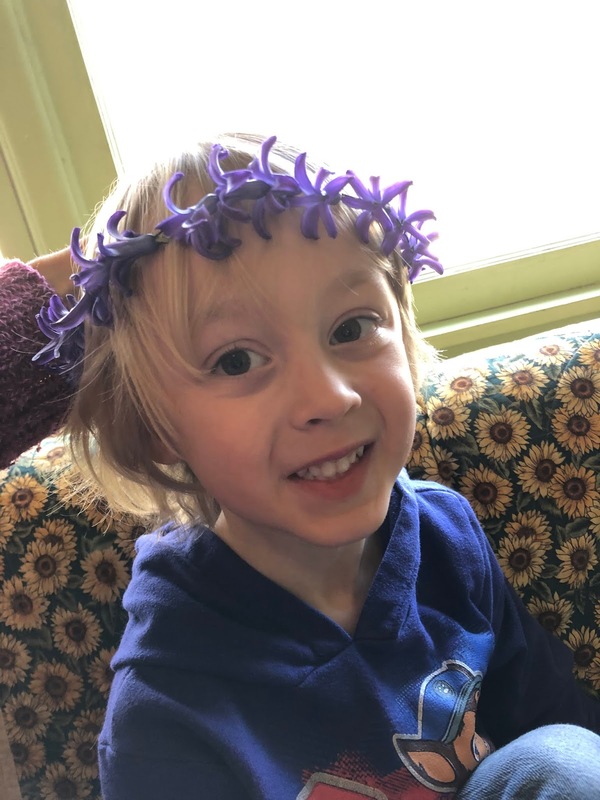 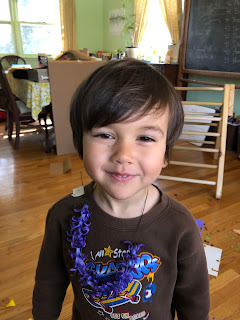 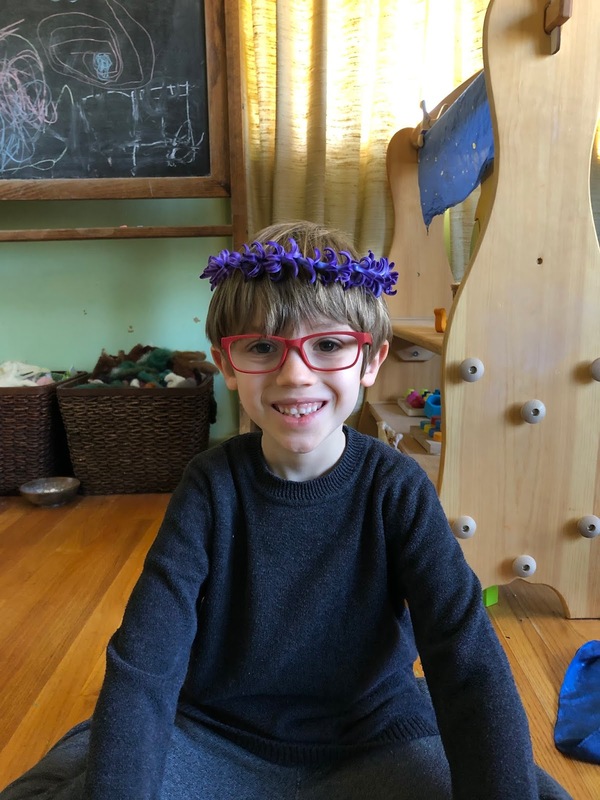 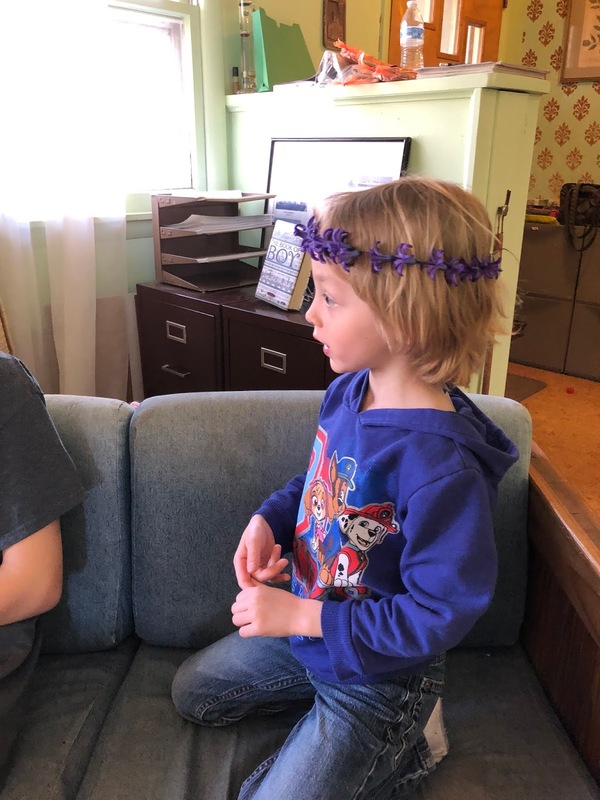 It was a joy to have the strong scent of hyacinth blossoms in the classroom today, and to help each child take a turn making a necklace or crown. 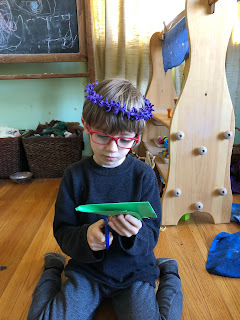 They worked so so carefully to line up the end of the needle with the end of the blossom! We used a wonderful vintage pure linen thread through the hyacinth blossoms, so that the project is all natural and fully compostable. 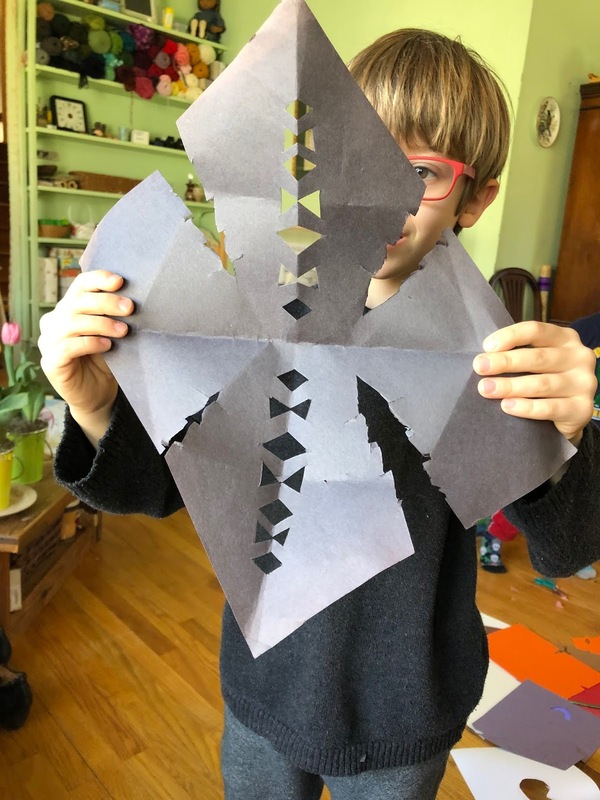 Today the paper cutting work which has been so popular for the past few weeks transitioned into an interest in folding. 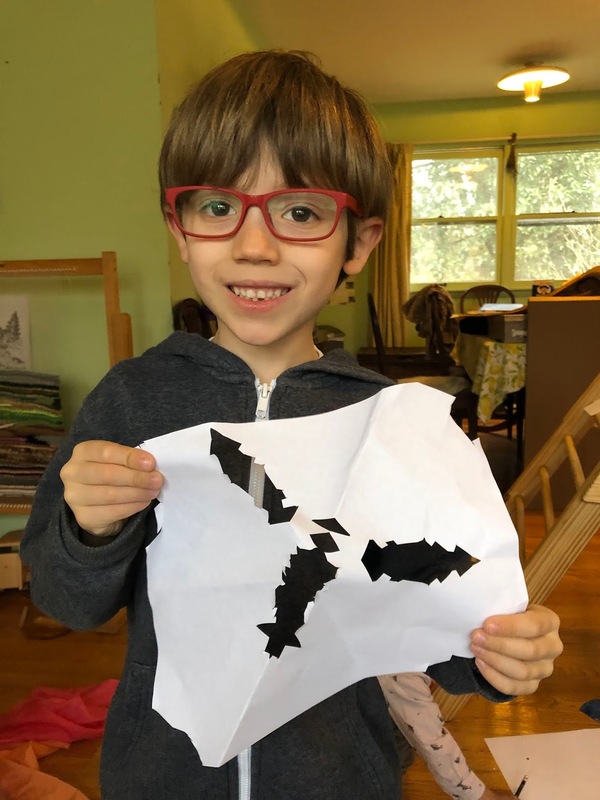 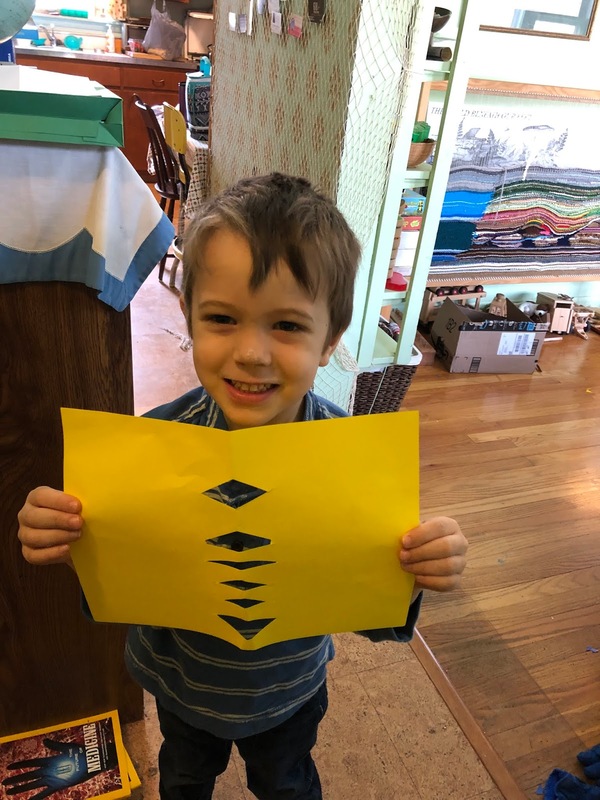 The children were folding the paper in many different ways and then opening it up to see what designs the crease marks made on their paper. "My folding is really good. 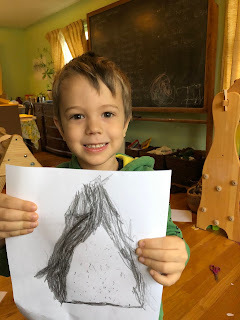 I'm an artist." 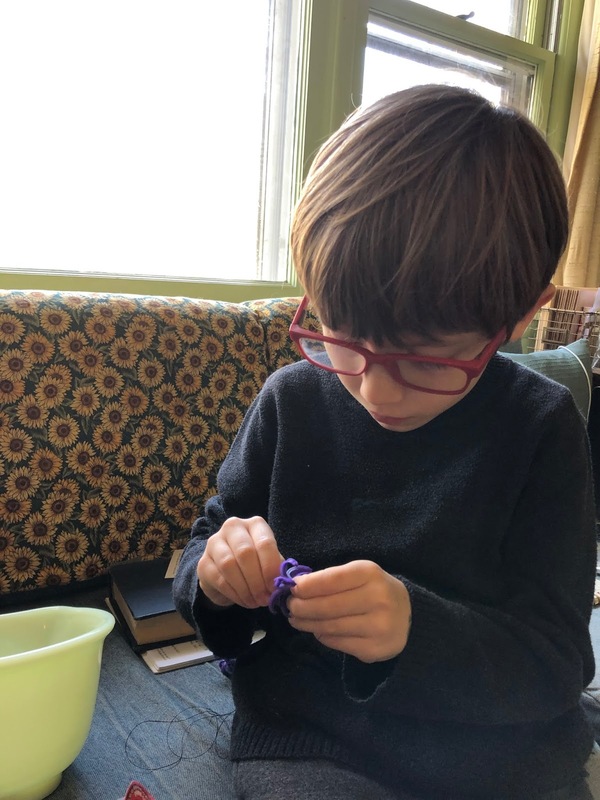 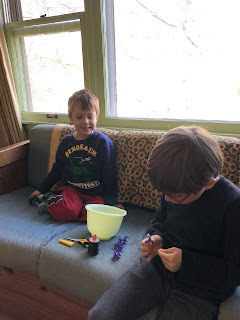 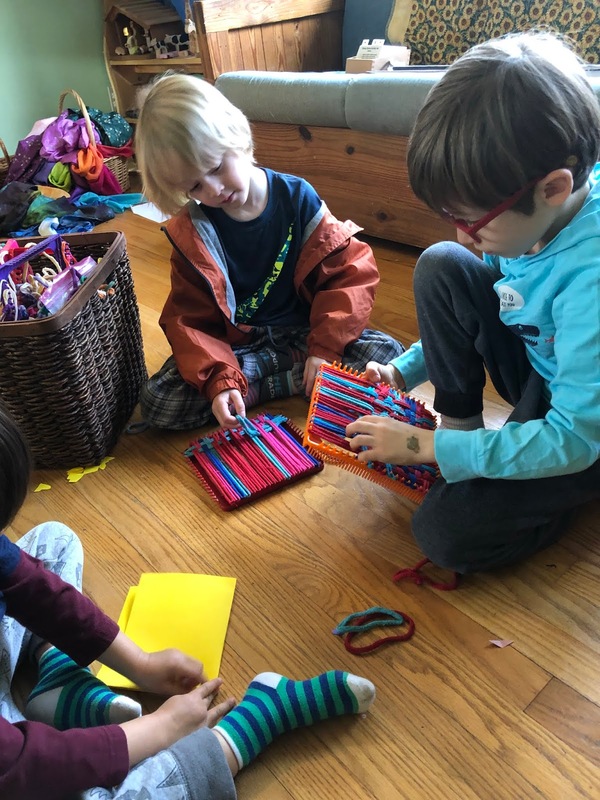 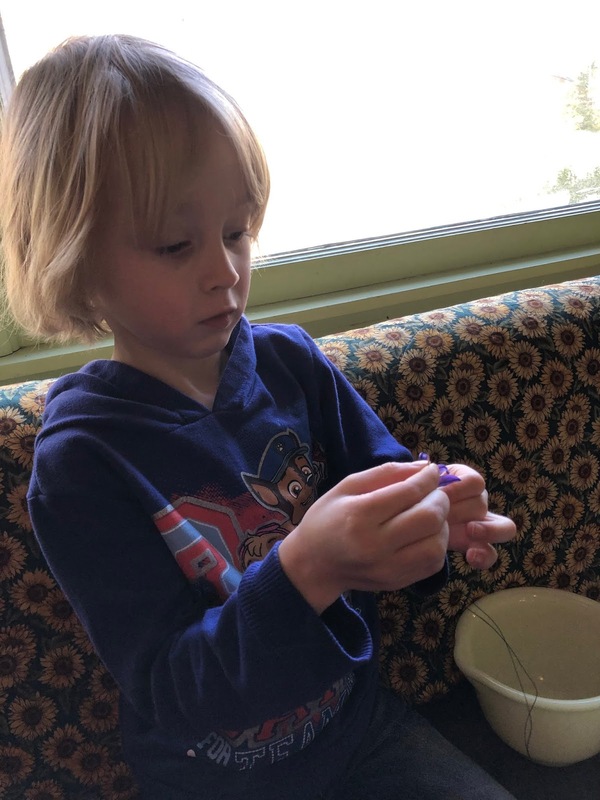 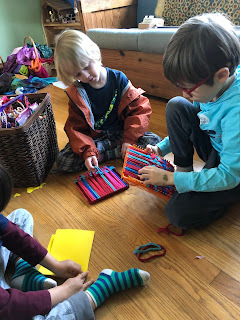 There was also a renewed interest in weaving and all of the potholder looms and loops were out all over the floor, while older children tried to explain the pattern of over, under, over, under to the younger children. 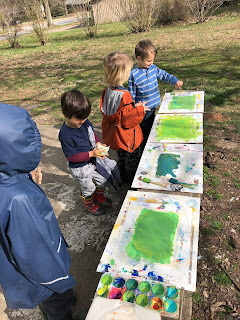 We took this beautiful day as an opportunity to also do some paint mixing and explored the different greens that we could make by combining yellows and blues. 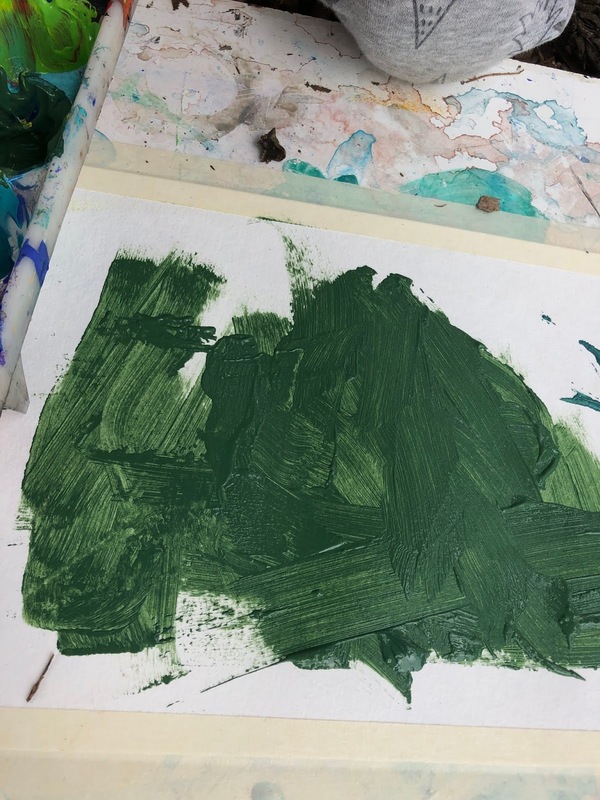 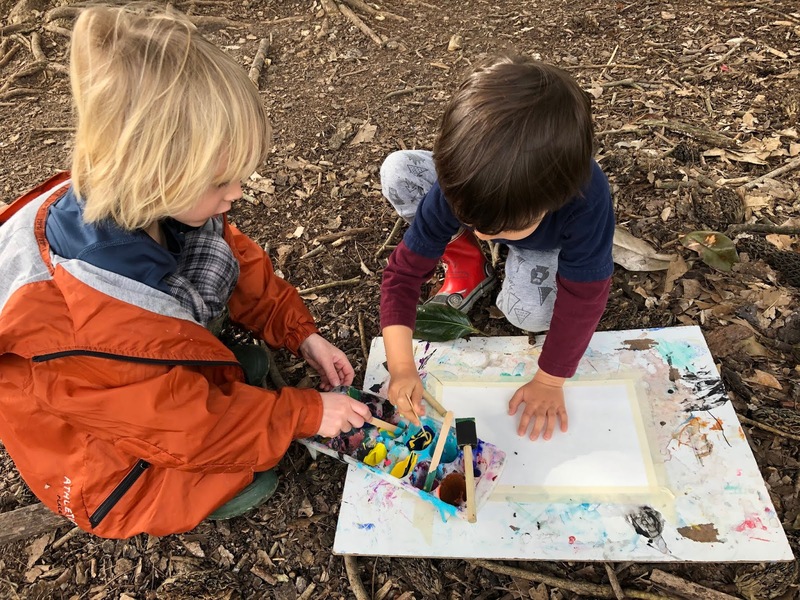 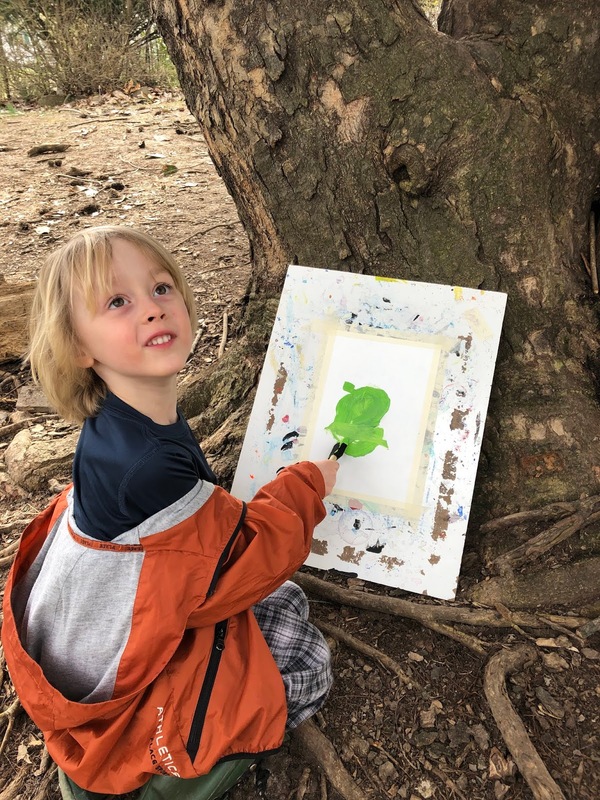 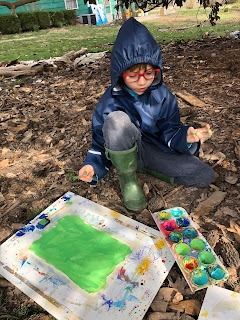 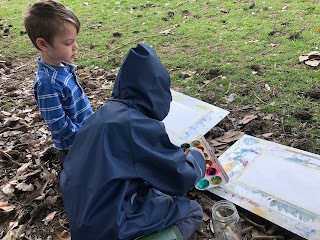 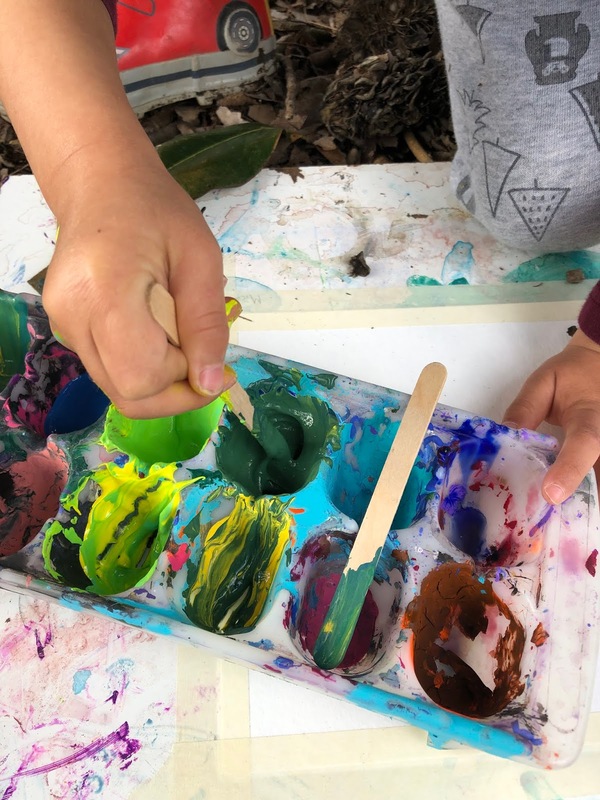 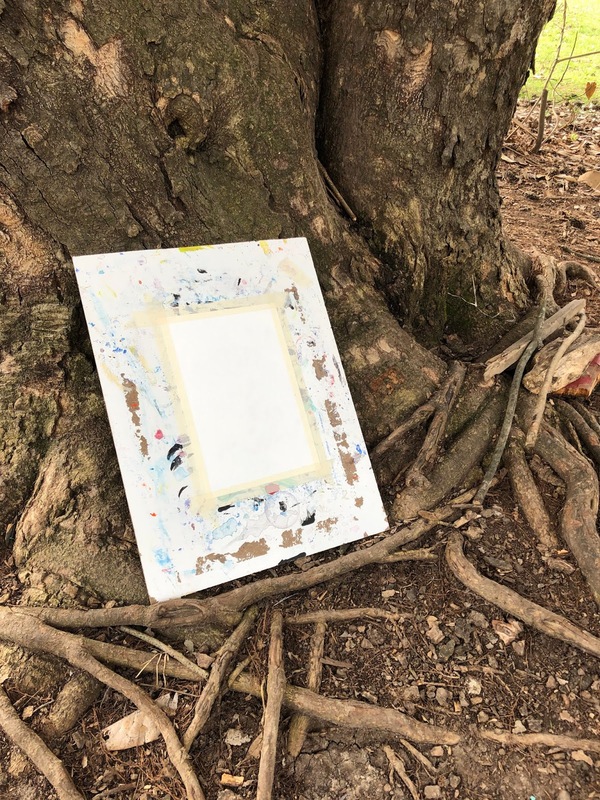 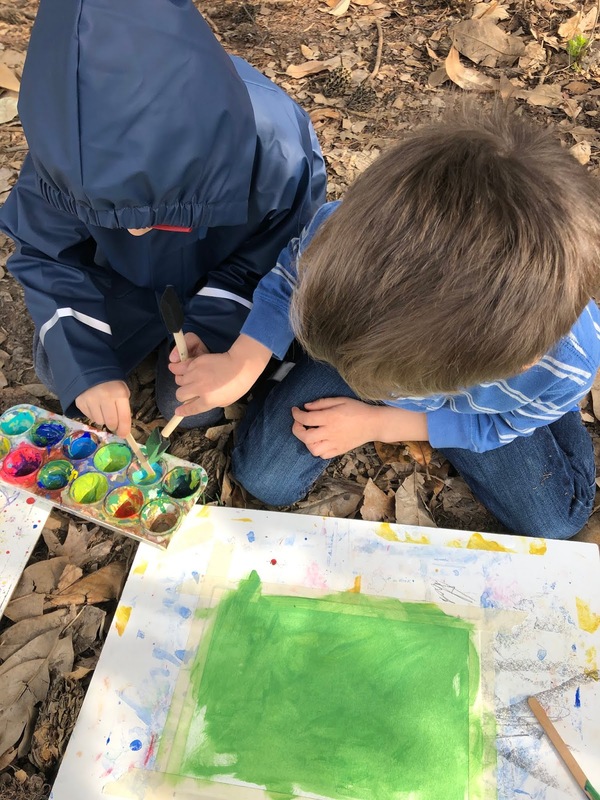 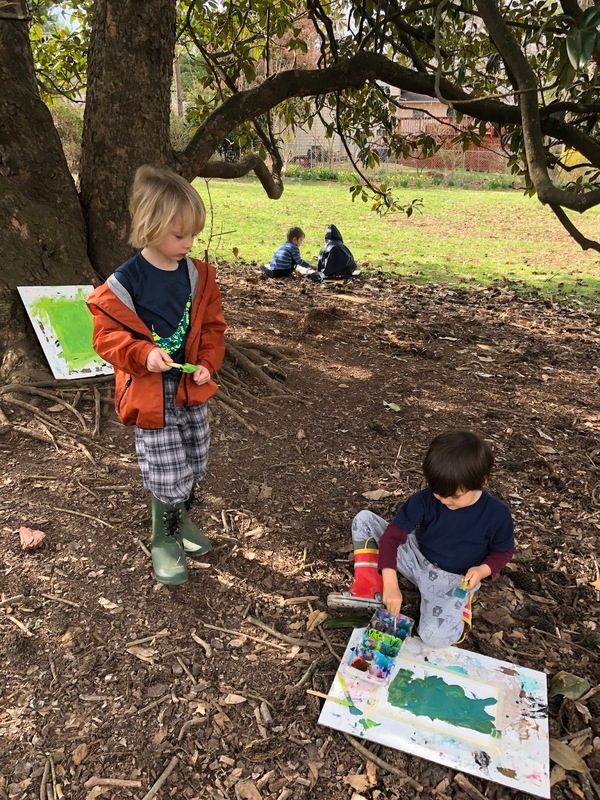 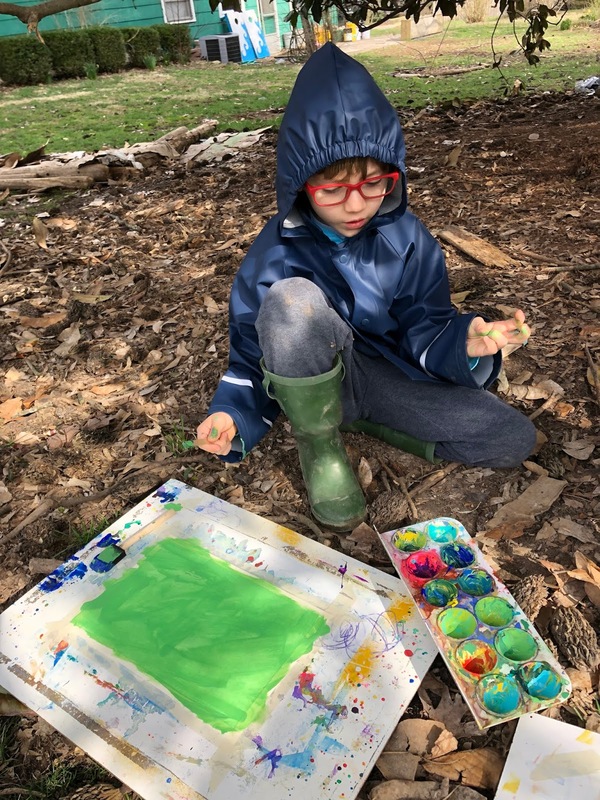 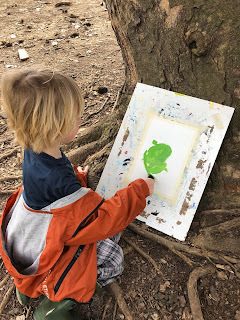 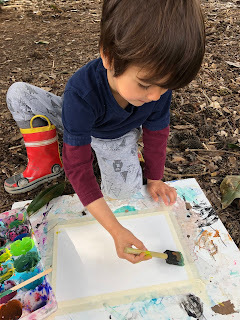 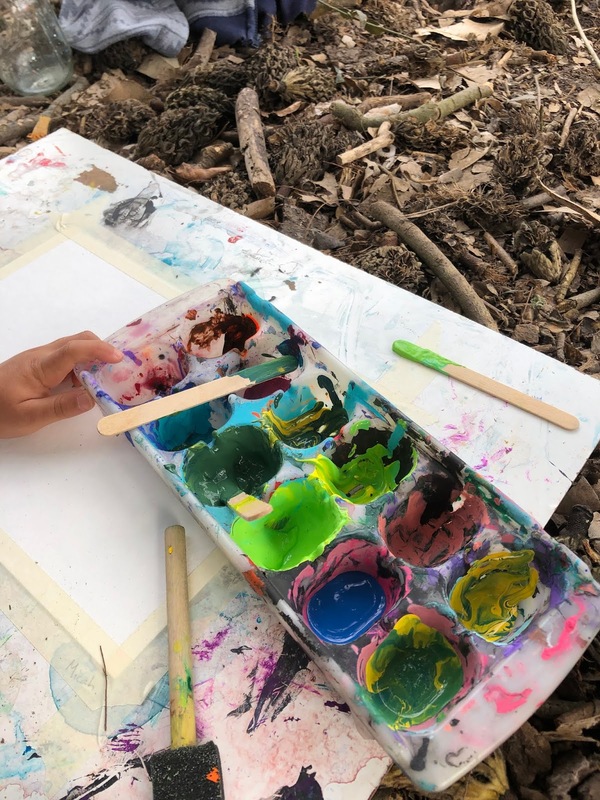 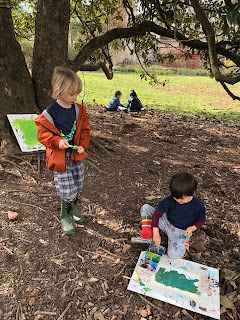 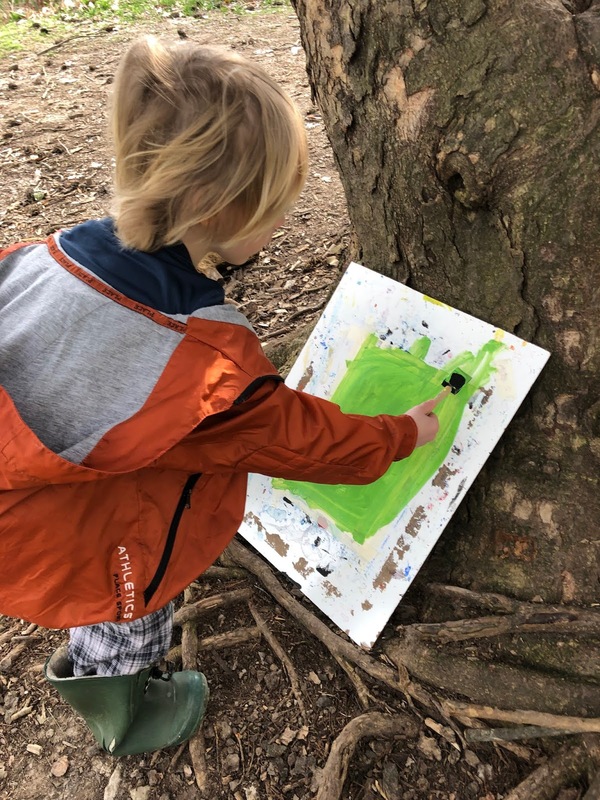 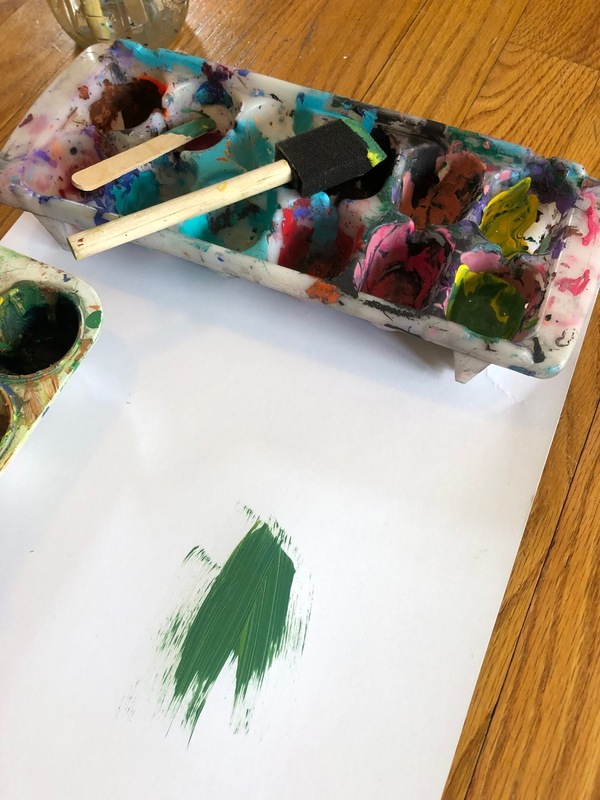 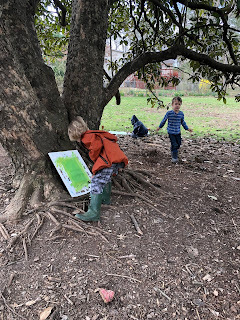 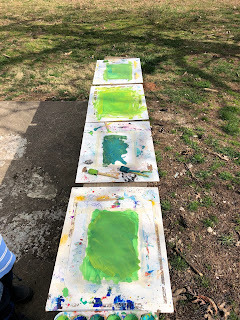 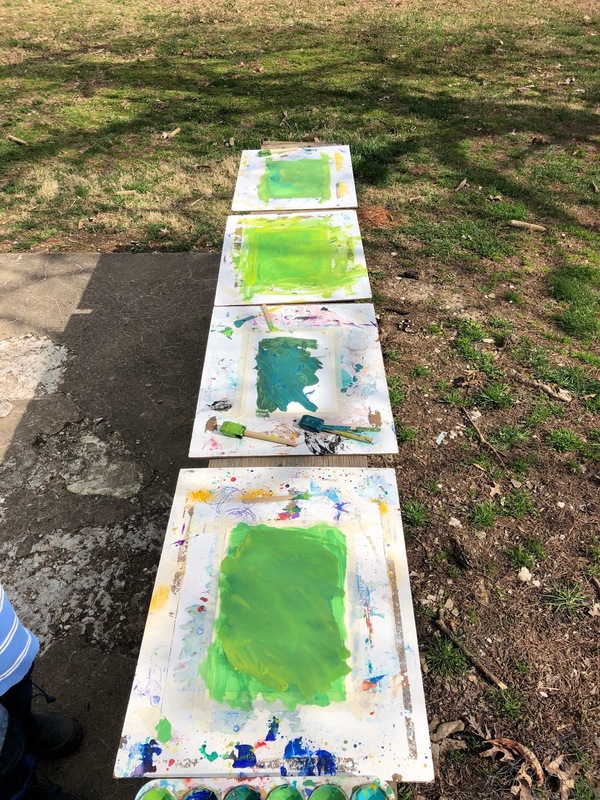 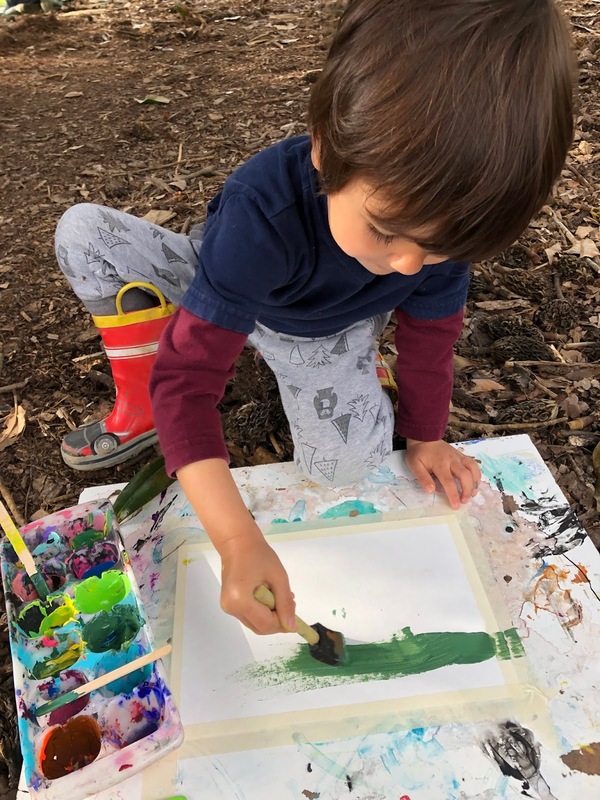 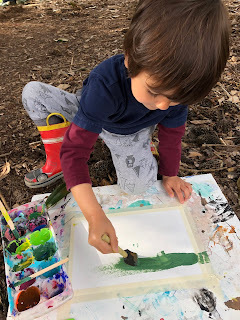 Then the children went outside with their paint palettes (old ice cube trays) and stirring sticks and brushes and stretched paper and painting boards and tried to find a Spring green which they would like to paint. Two children decided to paint the color of the brand-new grass and two children chose the evergreen leaves of the magnolia tree. 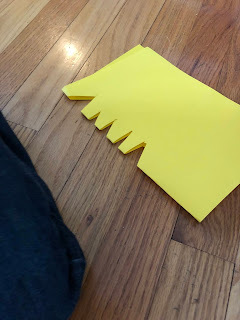 The children sat in the warm sunshine by their nature inspiration and mixed greens until they were satisfied with the color they had achieved, then painted their "grass" or "magnolia leaf" green onto their paper. 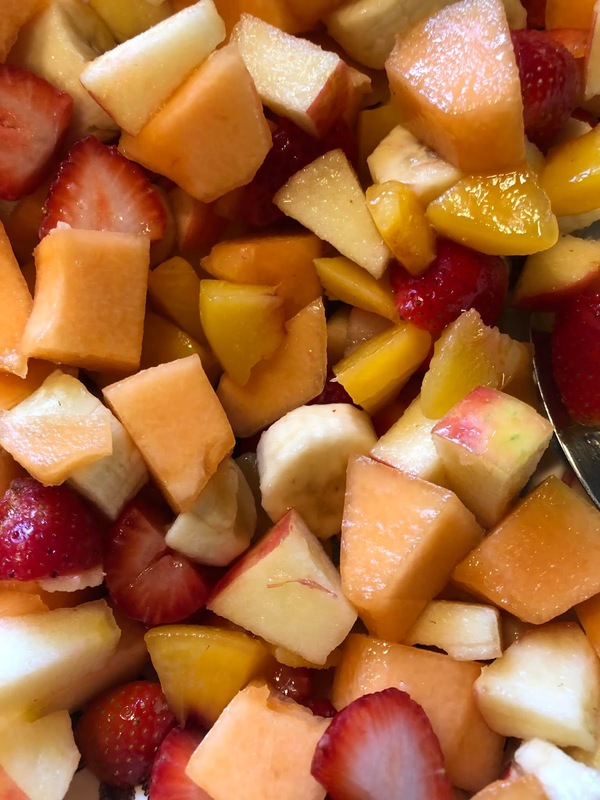 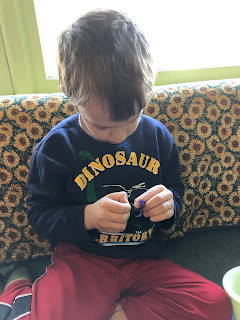 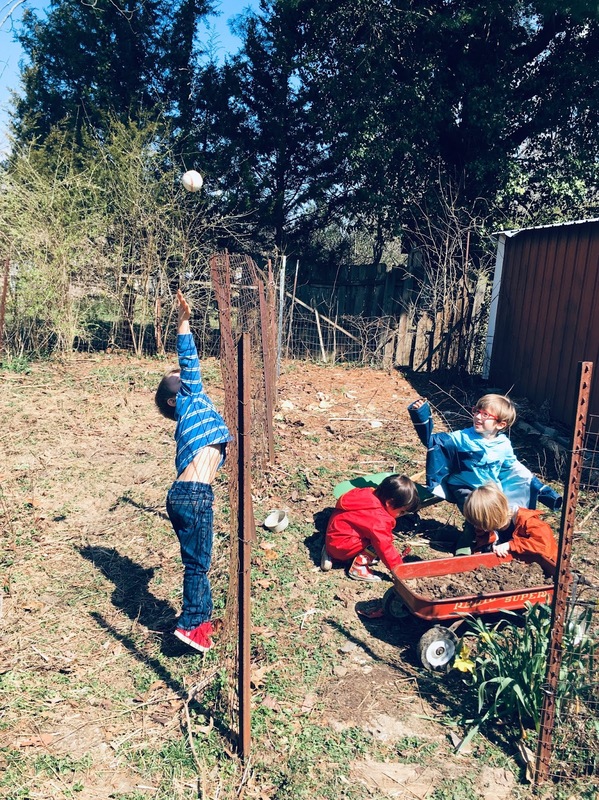 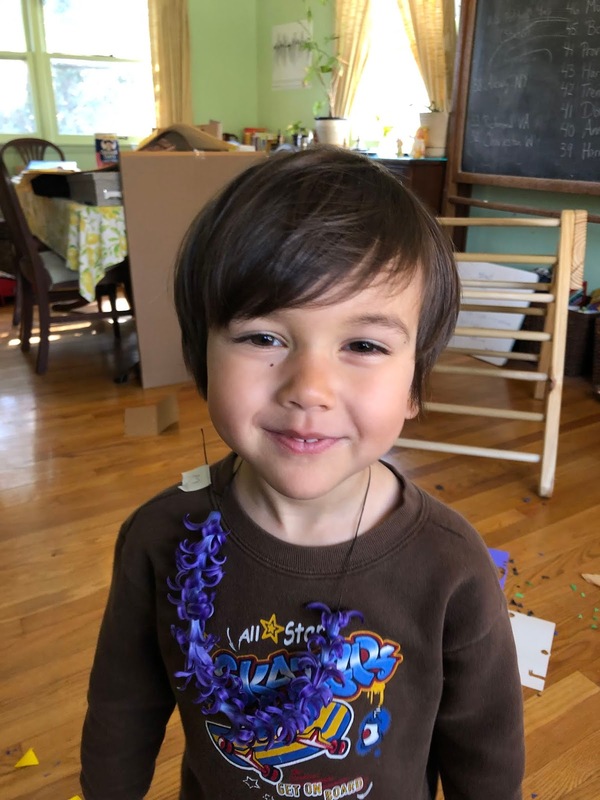 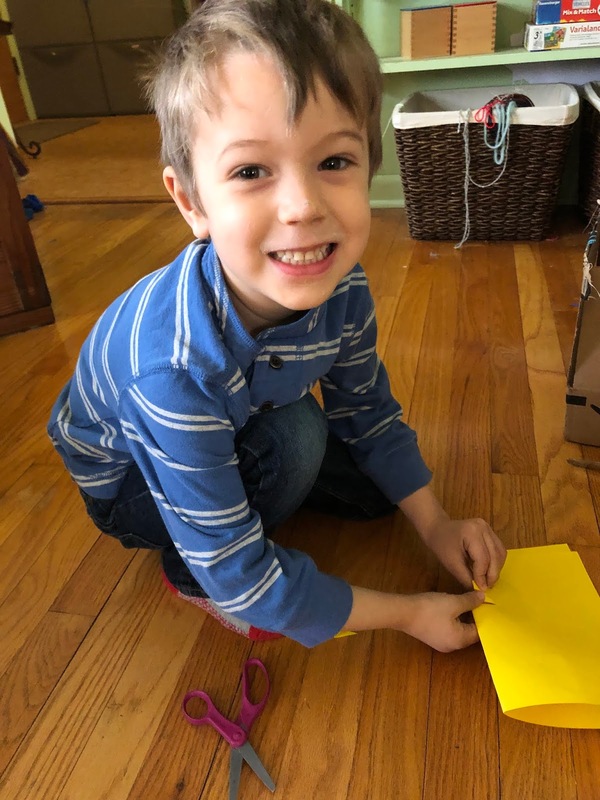 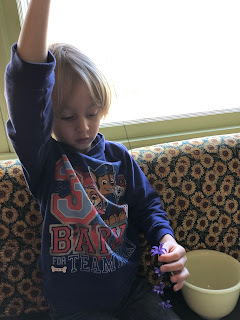 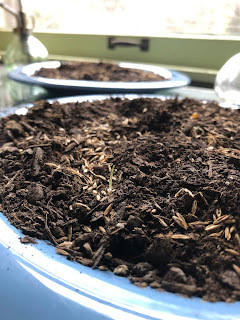 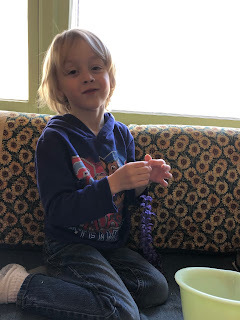 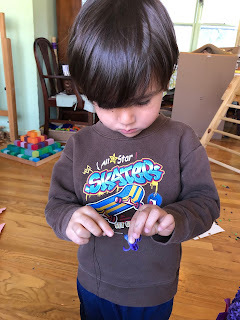 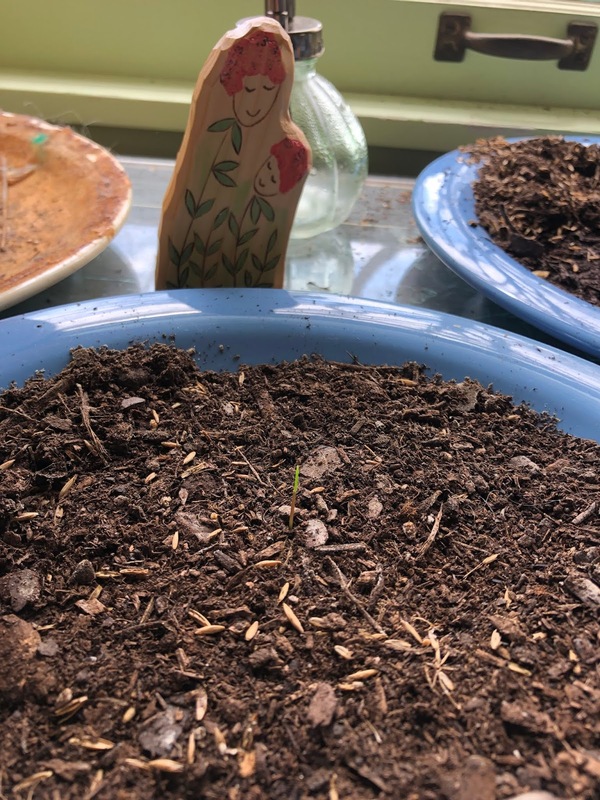 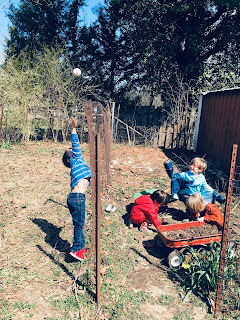 We enjoyed the familiarity of the Root Children Circle story and movement this week, but I chose to end the two week session with a very sweet story about tulips. I had deliberately purchased tightly closed tulips earlier in the week so that the children could watch them slowly open. 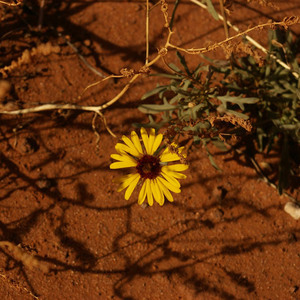 After our story, I placed the pots of flowers on the floor and let them gently peek inside. 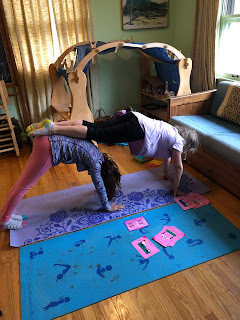 they want to do yoga too! 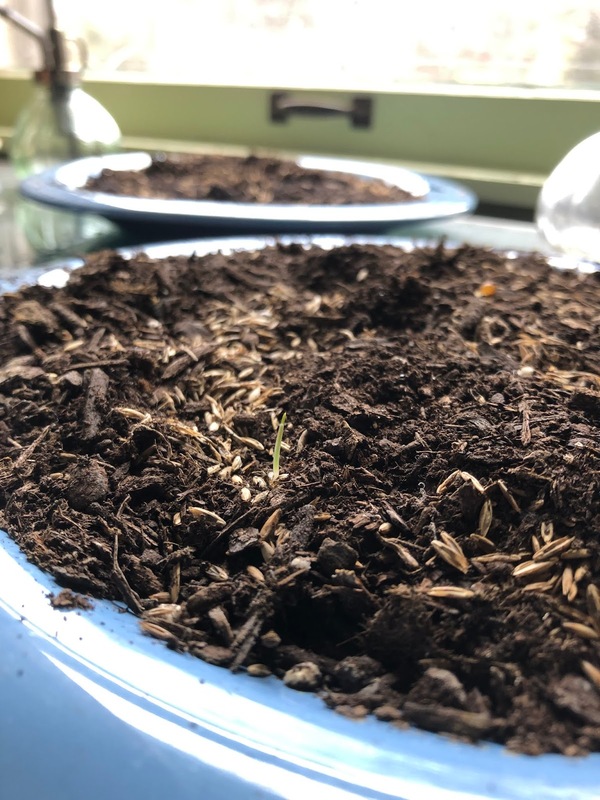 our Dish Gardens are beginning to sprout!